Okay, no wisecracks from me this week. I'll leave that up to you. When you're done here stop by Sanity On Edge where ettarose runs her weekly Craption Contest. And then be sure to hit up Kirsten's Caption This at The Soccer Mom Files. A member of the Child Safety unit unwinds after a stressful day. The L.A. Police, in an effort to soften their bad-boy image, are testing a fleet of prototype vehicles. Here, Officer Golstrom demonstrates a model with a convenient donut basket. Bruce demonstrates Bicycle Safety to inner-city gang members. Ride, Bruce, Ride! The press is disgusted that Officer Bluto stole a bike and used a taser on the little girl, even though she screamed "Don't tase me Bro" at the top of her little lungs. 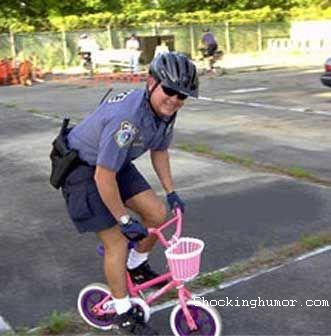 No one was sadder about the Police Department cutbacks more than Officer Jimmy. Unknown to most people, Richard Simmons' younger brother is a cop. The Aylmer, Québec police force has had to make a few cutbacks. Okay guys. I know me and this bike may not look right together, but I did wear my pink thongs to match. "Callahan, you're a loose cannon! One more screw-up and I'll have your badge and your My Little Pony." Weddings, parties, Funerals. Available for all occasions. Powered by the American Idol runners up academy.